Whispers in the Loggia: "Mother, Together We Will Fight... Together We Will Win" – At the Vatican, The Pope's "Marian Days"
"Mother, Together We Will Fight... Together We Will Win" – At the Vatican, The Pope's "Marian Days"
As the Year of Faith wends into its home-stretch, this weekend brings the gathering that might just be the nearest and dearest to its host's heart. While an increasingly paranoid Right has taken to trashing the Pope as some sort of "liberal," as Francis' Left flank has given its flagged penchant for "cosmos" baths a break to bask in a sense of his supposed "enlightenment," such is both sides' bloodlust for self-satisfied point-scoring that the ongoing ideological foodfight for "Catholic" supremacy has shown precious little regard for the reality of the man or the matter. 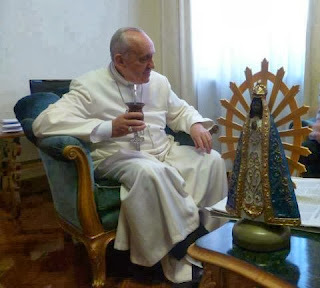 In sum, Jorge Mario Bergoglio is possessed of a Marian devotion as traditional and intense as that of the famously "Totus Tuus" John Paul II – a zeal the more horizontally-oriented only begin to imitate in condescending to it. At the same time, the Pope's passion for the Madonna isn't something he sees as meaningful merely for his own spirituality, nor as part of a push to "turn the clock back" – his term, of course – but instead as an emphatic endorsement of the life-giving, ever-potent popular piety which remains a cornerstone of his desired "poor church for the poor": the essence of being Catholic for those who rely on and endure in the faith amid life's gravest tests... a practice which the church's shepherds are called to embrace and integrate into the very heart of their ministries if they genuinely seek to attain the now-omniquoted "smell of the sheep." Indeed, as Francis himself has now expressed the thought on several occasions – Spadaro included – "If you want to know who Mary is, go to the theologian and he will tell you. But if you want to know how to love Mary, go to the People of God who teach it better.... [The people] are always asking for something closer to Jesus, they are sometimes a bit insistent in this. But it is the insistence of those who believe." ...and just behind, the 70,000 and more who've converged on Carthage, Missouri for over three decades each August to mark the weekend-long campout that is Marian Days. Most years, third place tends to go to the cathedral of Dallas, which often nets a crowd of 50,000-some for its Guadalupe feast. Regardless, here's the kicker: much as these events – and scores of others like them – just keep on growing and get even younger in turnout, in chattering circles of whatever stripe, the awareness of (and respect for) the whole lot remains inversely proportional to their size and the vitality they represent. Now, this isn't merely a stupid slip of the blissfully ignorant – we're ten years past that point. These days, sad as it is, for what claims to be a savvy, faithful, "representative" ecclesial discourse on an American Catholicism whose "minorities" now comprise its working majority, the lack of attention to and encounter with our own makes for a pretty embarrassing, if not outright discrediting, indictment. Then again, it just goes to remind that if you want to see The Church as Francis knows, wants and loves it best, you won't find it in any suburbanized, politicized, Anglo-centric journal or combox (or even what's above it), but huddled alongside the Mexicans who bike miles to Des Plaines in the Windy City's December freeze, riding the sweltering cross-country bus-trips to Carthage to spend the Days in tents with the Vietnamese, or hundreds of "hidden" instances elsewhere... because the words of an earlier age's poet on encountering the revolution in our midst are true yet again: "You will not be able to stay home, brother / You will not be able to plug in, turn on and cop out." Among those for whom that message isn't news, a crowd of 150,000 is expected for this weekend's celebrations in Rome, which will close with another open-air PopeMass on Sunday morning. At least this time, it will be televised – or, OK, YouTubed. Of course, the Vatican edition of "Marian Days" was scheduled to coincide with Sunday's feast of one of the most celebrated of visions: Our Lady of Fatima, whose final emergence on 13 October 1917 was accompanied by the "Miracle of the Sun," and followed ever since by a steady stream of conspiracy theories that'd give Dan Brown a run for his money. 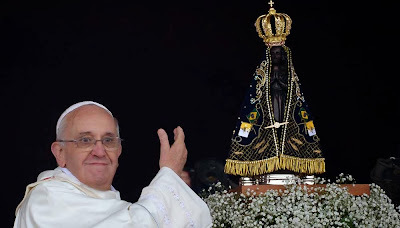 Along the way, though, it could be said that the more prominent observance in Papa Bergoglio's mind comes on the gathering's first day: 12 October is the feast of Our Lady of Aparecida, the patroness of Brazil, whose shrine was added to July's World Youth Day trip to Rio at Francis' own insistence on the visit's first morning, for the expressed purpose of consecrating his ministry as Bishop of Rome at her feet. Beyond being the global church's biggest Marian shrine in the largest Catholic country of all – the current basilica there seats 45,000 – Aparecida (where Francis has already pledged to return in 2017) is likewise the spot where Bergoglio's ascent to the papacy just happened to begin in earnest; at their decennial continent-wide plenary in 2007, the Latin American bishops tapped the Argentine cardinal to lead the drafting committee which produced their final statement. On its release, the result led the Jesuit to be recognized among the CELAM as the body's Visionary-in-Chief.... Six years later, the cardinals of the mega-conference fuelled the Conclave bloc which launched him onto Peter's Chair.... And now – amplified by Francis' two most significant speeches of any kind to date – the Aparecida Charter penned by the 266th Pontiff is rightly seen as the most authoritative programmatic guide to the first papacy born of the American continent. When the now-Pope and the ever-Virgin came face to face again, veteran Bergoglio-watchers said that his moments before the foot-high wooden statue made for "the most emotional" they've ever seen him. Breaking his now-familiar form, Francis zipped past the shrine's Redemptorist priests to make it to the Madonna, needing to be prodded by his entourage both to start saying the prayer he apparently wrote on his own and – caught in an apparent trance – to depart after offering it. whose demands we only glimpse. Yet in your faith that "nothing is impossible with God,"
and so I cannot hesitate. "Behold the handmaid of the Lord! Let it be done unto me according to your word!" win together as your Son and you always walked together. "Woman, behold your son! Son, behold your mother!" that he might be fully available for the mission which awaited him. all that I am and all that I have. which can be at service of life, of mankind. "Father, welcome and sanctify your youth!" sustain our hope and our faith. "Keep faithful, and I will give you the crown of life. Amen!" 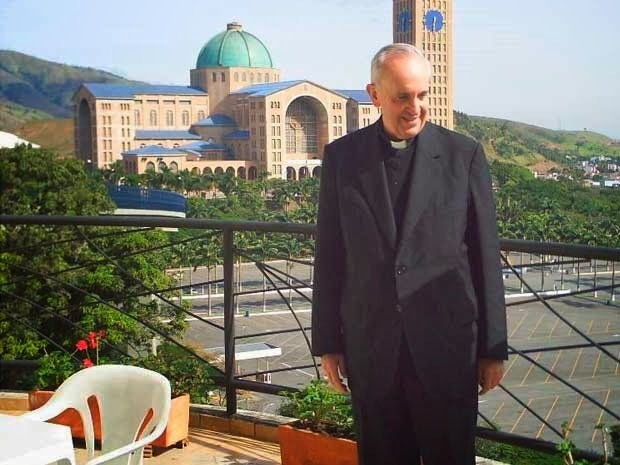 "Francis, Go and Rebuild My House"
Francis, What Is Your Faith?